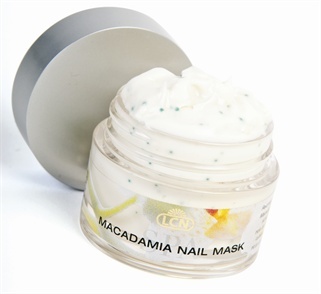 LCN’s Macadamia Nail Mask greatly improves the skin’s ability to retain moisture, and is applied over the eponychium and tips of fingers. The addition of vitamin C improves the synthesis of the skin’s own collagen and fights free radicals. Macadamia Nail Mask contains the following nut oils: Macadamia nut, Brazil nut, walnut, and hazelnut. It is also made up of shea butter, which has a soothing and moisturizing effect and supports cell regeneration of dry skin. Macadamia Nail Mask protects against damage caused by sunlight and damaging agents. For more information, visit LCN.